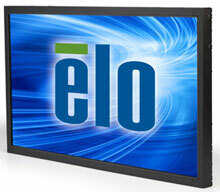 Elo 4243L - 42-inch wide LCD Open Frame, Full HD with LED backlight, VGA & HDMI video, IntelliTouch Plus, USB Interface. The Elo Touch Solutions 4243L 42-inch full HD open-frame touchmonitor provides smooth dual-touch performance with IntelliTouch Plus surface acoustic wave technology. The 4243L touchmonitor is 2.6" (65 mm) in total thickness and less than 1" (25 mm) in border width. The new sleek mechanical design enables thinner and smaller kiosk design for various applications like retail, hotel, gaming, transportation and other commercial users. The touch screen glass tested with robust "ball-drop" requirements supporting applications in demanding public access environments. Replacement OSD Controller (wired remote) for the 3201L/4201L/7001L. The Elo E000444 is also known as Elo Touch Systems	ELO-E000444	.